Matera was once called "the shame of Italy". This city in the Basilicata region in Southern Italy is one of the oldest inhabited settlements in the world. It was depopulated in the 1950s due to the wretched and unhealthy living conditions of its residents. It continues to be rehabilitated today and has been named one of two European Capital of Culture for 2019, an honor it received over other finalists like Perugia, Ravenna and Siena. San Pietro Barisano is the largest rupestrian church in Matera. It's possible to see the 12-13th century rupestrian structure under the church floor where the extensive passageways are extremely narrow and feels claustrophobic. The altars above ground were stripped bare (many works of art were stolen from the church in the 60s and 70s after the exodus of residents to better housing) with the exception of the altar of Santa Maria della Conciliazione which has a stone image of Mary being crowned by angels and holding the child Jesus. Behind the altar is a sunken chapel with frescoes of saints and the Annunciation from the 15th-16th centuries. There is a 3 euro entrance fee to the church which is now a museum. Taking photos inside the church is forbidden. Via Lanera 14. There are two sassi districts in Matera, Barisano and Caveoso. The images here were taken in the Sasso Barisano. Sassi in Italian is defined as stone. The cave dwellings in Matera were hewn into the rock. In the photo above, a courtyard has been decorated with plants and flowers, a happy contrast from the cold stone structures. Looking down at the ancient settlement and signs of modern day life. Winding cobblestone streets remind me of the crèche I used to see at Christmas when I was a child. 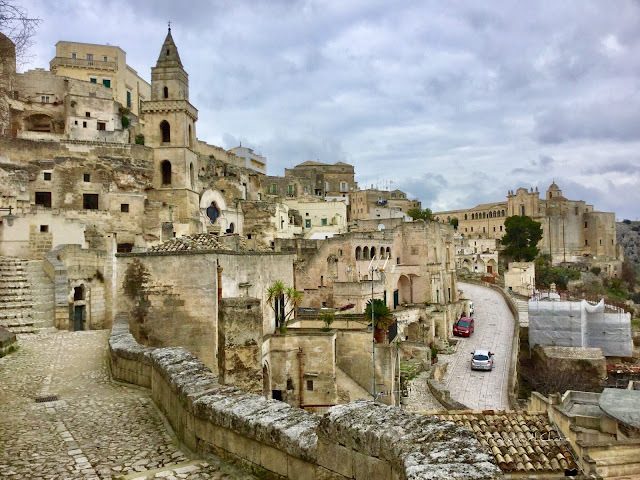 Matera embodies the characteristics of what Bethlehem may have been during the birth of Jesus so much so that it was the setting for the movie, The Nativity Story. The Passion of Christ was also filmed in Matera. On Piazza Vittorio Veneto, you can see and explore underground cisterns or stop at a belvedere for a sweeping view of the sassi. From Bari Nord Station (next door to Bari Centrale), take the Ferrovia Appulo Lucane (FAL) train to Matera. One way fare in January 2018 was 4.90 euros and it takes approximately 2 hours to get there. Check the posted schedule for times of departure and purchase a ticket that doesn't require a transfer along the way. There is a ticket office on the ground floor at Bari Nord. The train station in Matera is about a 5-minute walk from Piazza Vittorio Veneto and Sassi Barsino. Matera Centrale has a small waiting room upstairs. Otherwise, go downstairs to the train tracks to wait for your train. Il Cantuccio Ristorante on Via delle Beccherie 33. Ordered the orechiette pasta which is typical of the Apulia region. Efficient and friendly service. They didn't rush me though it was closing time.